The Northeast includes Maine, New Hampshire, Vermont, Massachusetts, New York, Rhode Island, Connecticut, New York, Pennsylvania, New Jersey, Delaware, Maryland, and West Virginia. The most populous region in the US, the Northeast coastal corridor from Washington, D.C. to Boston, MA contains 17% of the nation’s population on 2% of the land.1 Inland, the region is known for its ecological diversity and small-town farming. The hills and valleys of the Appalachian Mountains, as well as their numerous sub-ranges, create havens of biodiversity isolated from human populations in the region. 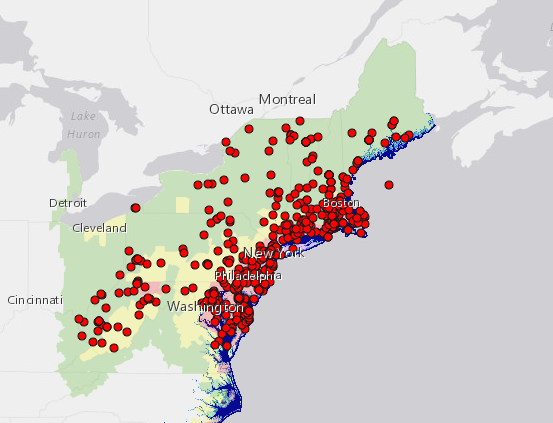 Because so much of the Northeast’s infrastructure is centered on coastlines, it is highly vulnerable to hurricanes, flooding, and sea-level rise. The 2012 Hurricane Sandy caused an estimated $60-80 billion in damages across New York, New Jersey, and Connecticut. Transportation systems were crippled as subway stations filled with water and highways flooded. The impact of hurricanes illustrates the region’s vulnerability to rising seas due to melting ice and to increasingly frequent and more severe storms. Although the Northeast has an extensive history of land use and high population densities, biodiversity is found in rural areas and state parks as well as directly within urban centers. Ecological experiments abound in the towns and cities of the New England, with residents frequently encountering coyotes, raccoons, and bears as suburbs sprawl into forested areas. Thousands of shorebirds roost in the islands of New York City’s harbor, millions of migrating birds visit the city’s parks, and cameras recording hawks nesting on skyscrapers surge in online popularity. Links between biodiversity and humans are unfortunately also exemplified by diseases that are shared or catalyzed to spread between people and animals. Native bat populations have been decimated by a fungal disease known as White Nose Syndrome, which can be spread by humans moving the fungus between caves. The loss of millions of bats has diminished their natural ecological service of consuming insects, resulting in larger insect populations that pose risks to crops in the region. On the other hand, deer populations continue to grow in the absence of their natural predators (wolves), providing more and more opportunities for the transfer of Lyme-disease-carrying ticks from deer to humans.